Sean Dyche hopes striker Sam Vokes will be fit to return at Cardiff City on Saturday. 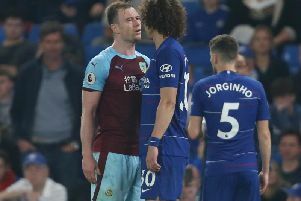 Dyche had expected the Wales international to be available for Sunday’s 1-1 draw with Brighton, having missed his country’s friendly with Holland a week last Friday with a groin problem. But he decided not to risk the 26-year-old, with a view to renewing his promising partnership with 11-goal Andre Gray this weekend. “It was minor, but sometimes I have to make the decision, and there’s a bigger picture than just Sunday. Gray scored his eighth goal in six appearances at Turf Moor, netting in his fourth-successive outing on home turf, and Dyche is delighted with his impact: “He’s still improving, there’s a lot he’s got to learn and he’s doing that. “But the team was more than Andre on Sunday. “He had quiet spells and then set up a chance for Scotty (Arfield).